No city in Germany is quite like Berlin. 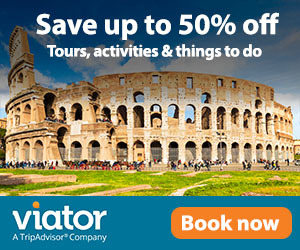 Whether you’re interested in historical sites from WWII, the city’s subsequent division under Soviet rule, street art, international cuisine, or world-class museums, the city has something for everyone. Next to centuries-old buildings, modern new businesses spring up daily. The city changes so quickly that the Berlin you visit today won’t be the same you see tomorrow. It’s a happenin’ place, Berlin. I truly didn’t realize how much so until New Year’s weekend. Travis and I spent several days sightseeing in the city, finishing out 2016 and ringing in 2017 from a house boat on the Spree River. 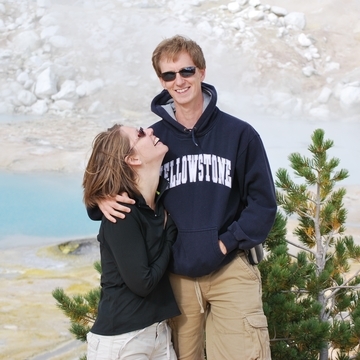 It was Trav’s first time in Berlin, but I’d visited with friends when we lived in Switzerland. Things I’d seen just a year before were simply gone; when I led Travis to a section of the East Side Gallery to show him my favorite mural, not only was the mural gone – the entire block had been demolished. That’s how fast the city is changing! Still, with no shortage of attractions to keep us busy, we set out to explore the city on foot. 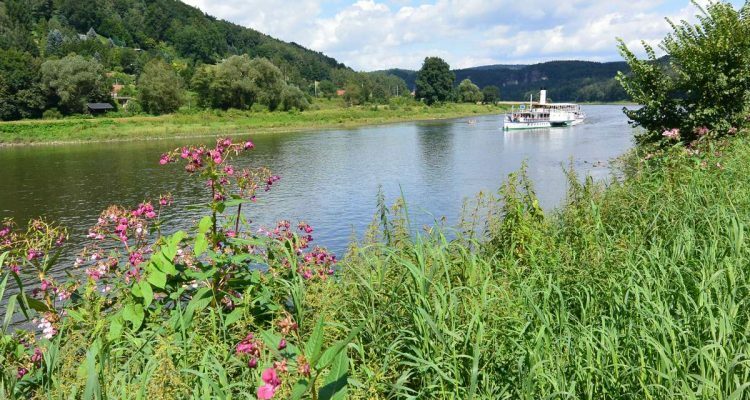 In no particular order, these are the highlights from our self-guided walking tour. 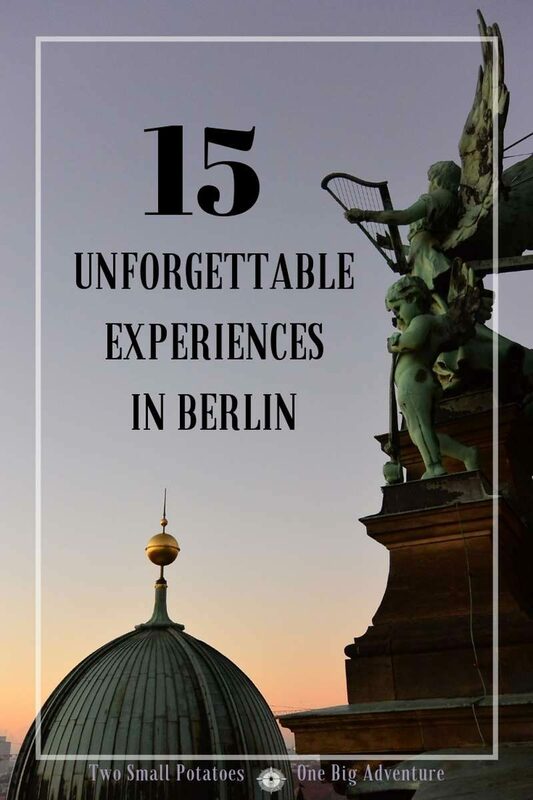 If you find yourself in Berlin and follow along in our footsteps, these 15 experiences will give you a sense of the city’s essence – from its fascinating history to its dynamic and colorful modern evolution. 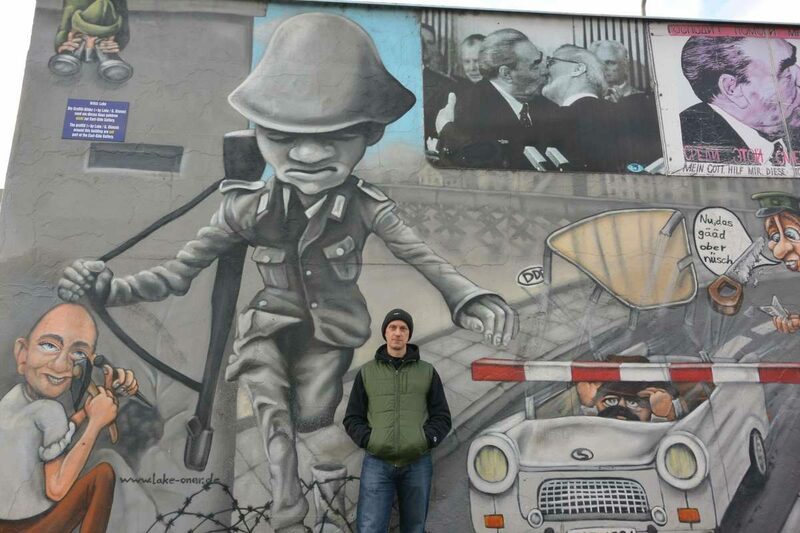 Travis poses in front of a mural of Checkpoint Charlie at the southeastern end of the East Side Gallery. The East Side Gallery is the longest remaining section of the Berlin Wall. 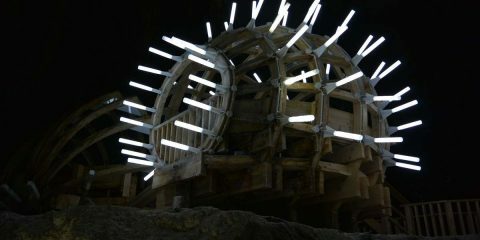 The site spans 1.3 kilometers and exists as the largest open-air museum in the world. In 1990 after the official demolition had begun on much of the Wall, artists were commissioned to paint 105 panels along this stretch, which remains as a memorial to freedom and a reminder of a dark period in the city’s history. Despite attempts to preserve the murals, officials appear to be losing the battle as vandals continue to cover them with graffiti. Murals (like the one above) that were marred with minor graffiti during my visit to Berlin, the Gritty City in 2015 have been virtually obliterated. Some artists are in the process of repainting the murals. The ones that have been completed smell of fresh paint and are blocked off behind metal barricades. Yet the graffiti is somehow fitting, as much a part of Berlin’s character as the Wall itself. If you make it the entire 1.3 km length of the East Side Gallery, you’ve earned a donut. Tucked away inside the train station just across from the end of the Gallery, Dunkin’ Donuts offers a dizzying and colorful variety of donuts. Plus, they have giant American-sized coffee drinks to sip while you get back to sightseeing. 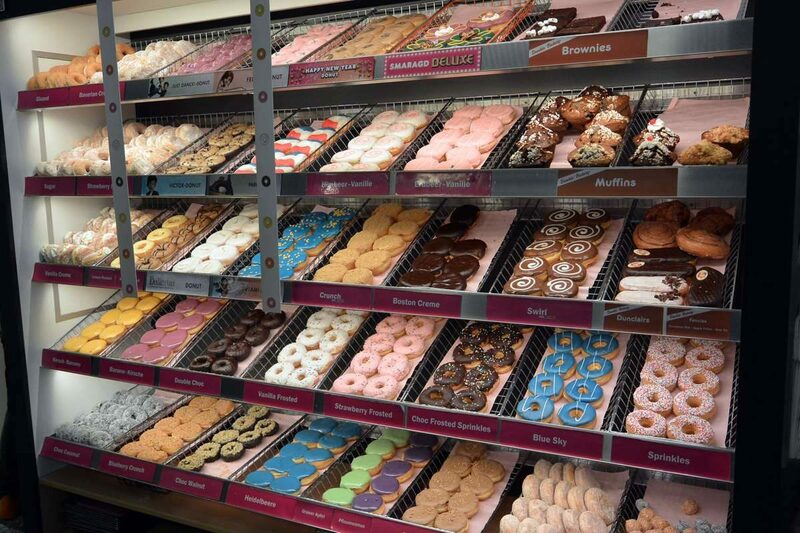 A wall of brightly colored Dunkin’ Donuts is like the jackpot at the end of the rainbow. As you walk through the city, look around you. Do you notice anything different about the buildings? The streets? The pedestrian signs? Telltale signs you’re in East Berlin include above-ground pipes forming a network over the roadways and “Ampelmännchen,” distinctive little men with hats on pedestrian signals. From one block to the next, you can often tell when you’ve entered what was once Soviet-occupied East Berlin. The architecture favored by Soviets was famously inexpensive and low-quality. And the color? Typically grey. 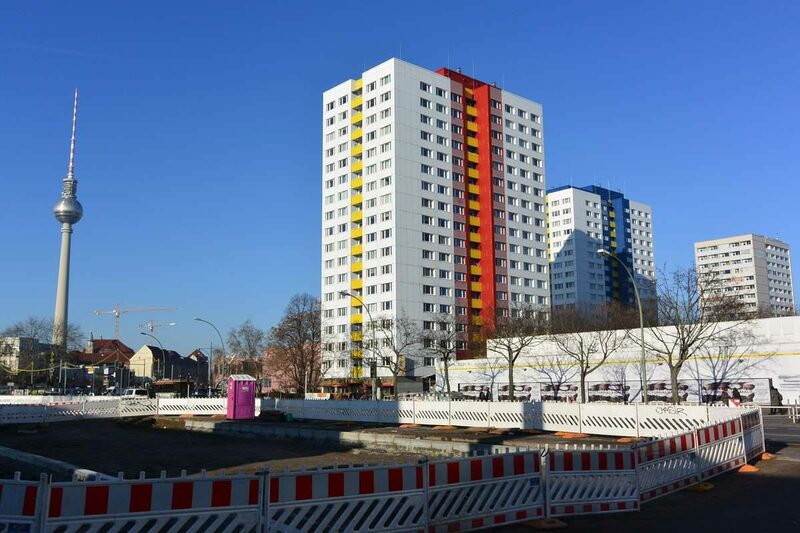 In an effort to provide housing for the masses, the government built Plattenbauten, unattractive cookie-cutter complexes that still dot the city. Rather than tear them down, Berliners have been looking for clever and artistic ways to honor their history. Bright orange, yellow, and red paint brighten these “Plattenbauten” along Alexanderstrasse. The city of Berlin grew up around the Spree River. Winding through old historic neighborhoods, trails along the river offer a chance to escape the steady throb of traffic along nearby streets. Numerous bridges allow unobstructed views of old buildings with interesting architecture. 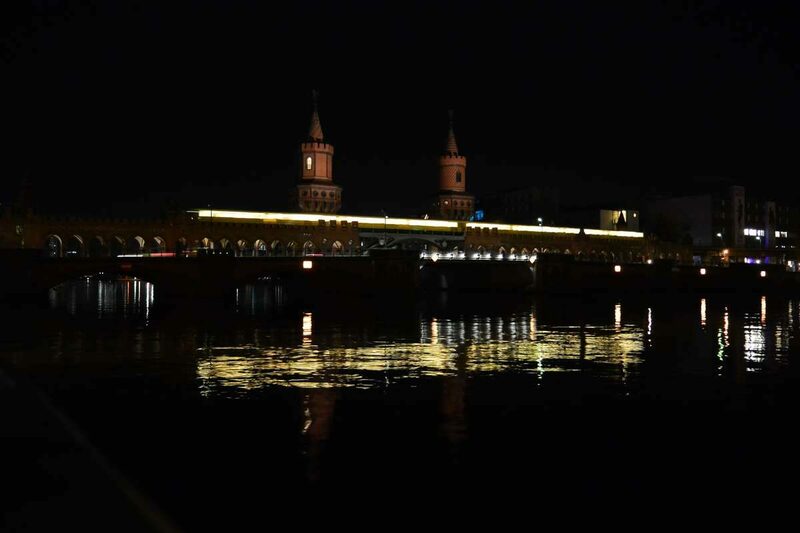 From An der Schilling Bridge, the Spree River stretches toward Berlin’s famous TV Tower. The old red & yellow building on the right, once a pumping station, now houses Radialsystem V, a center for the arts. 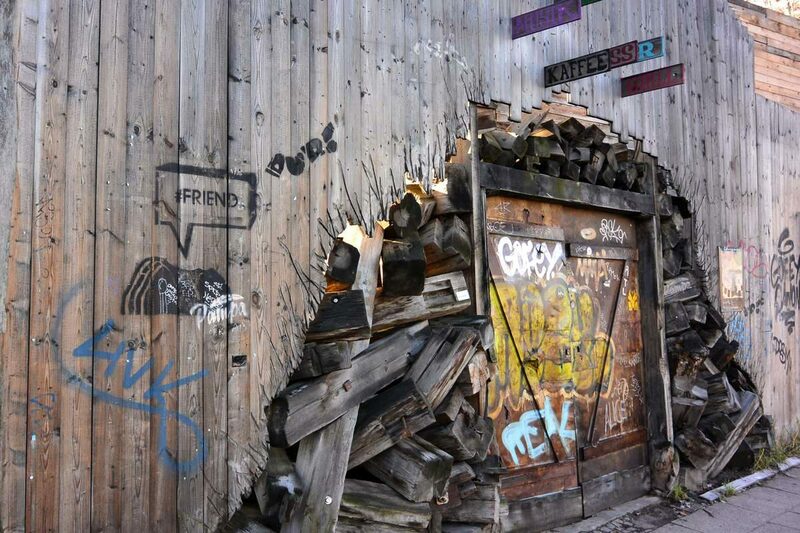 As a young and hip city, it’s common for many of Berlin’s trendiest restaurants, bars, and night clubs to appear as nothing more than a graffiti-riddled makeshift entry. Turn your nose up and you might just be passing one of the city’s most coveted restaurants or the night club of your dreams. This nondescript doorway along Holzmarktstrassee is adjacent to the official entrance of Fame Restaurant, which was featured in the NY Times. The Nikolaiviertel, or Nicholas Quarter, is the heart of Berlin. Built up along the shores of the Spree River in the 13th century, this neighborhood is what remains of the city’s medieval origins. Nowadays, visitors can stroll through old, narrow streets, then do a bit of shopping in an upscale boutique or relax with an espresso at a cozy cafe. 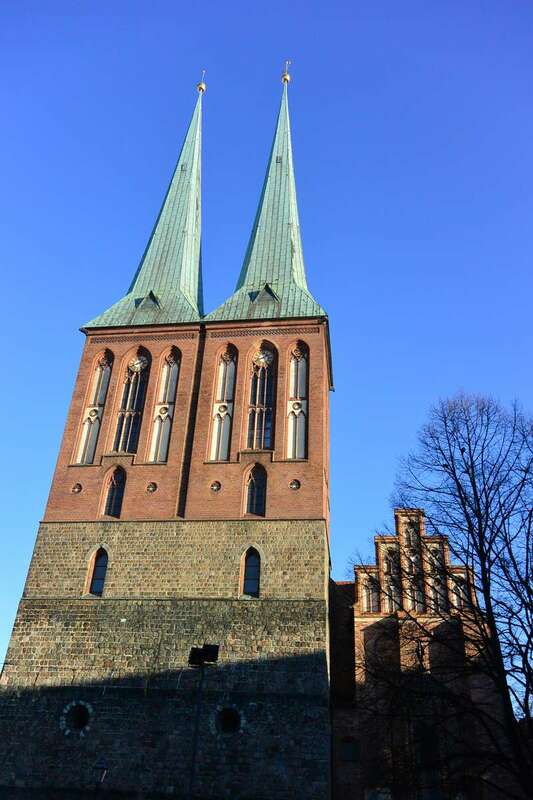 The centerpiece of the charming neighborhood is St Nicholas’ Church, the oldest in Berlin. When construction was completed in 1230, it served as a Roman Catholic church and then a Lutheran church before being surrendered to the government in 1938. Largely destroyed during WWII and then left in ruins for decades under Soviet rule, St Nicholas’ was finally rebuilt in the 1980’s. 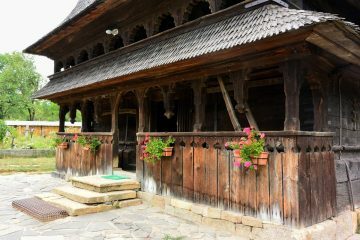 No longer a place of worship, it now serves mostly as a museum. St Nicholas’ Church is at the heart of the historic Nicholas Quarter in former East Berlin. No, this is not the dragon slayer from Game of Thrones. 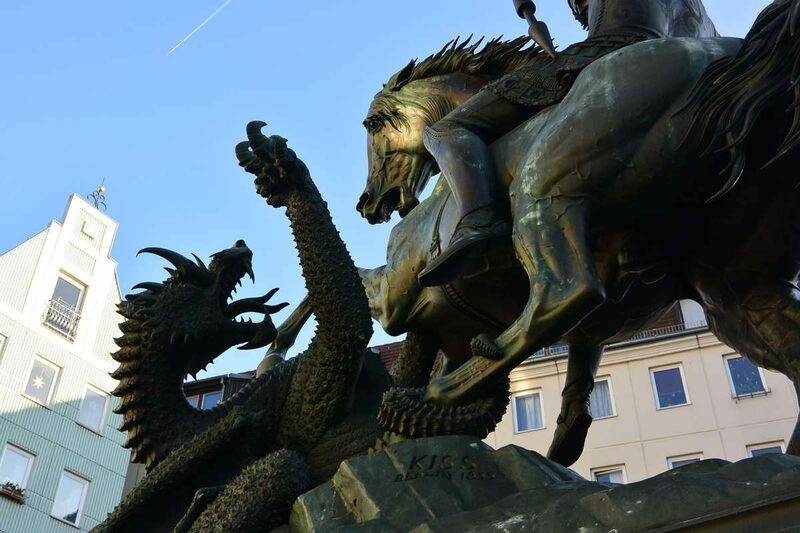 The statue, St George the Dragon Slayer, is based on a popular European legend about Saint George, a Roman soldier who was martyred in AD 303 for refusing to give up his Christian faith. Later stories morphed into tales of his heroism in slaying a dragon to free a princess, and his image has long since become equated with the triumph of good over evil. The statue is one of the most beloved monuments in Berlin and is truly stunning in detail up close. Created by sculptor August Kiss in the mid-1800s, the piece was moved several times before finding its permanent home between the Spree River and St Nicholas Church. The Rotes Rathaus, or Red Town Hall, is the official seat of government for the city of Berlin. 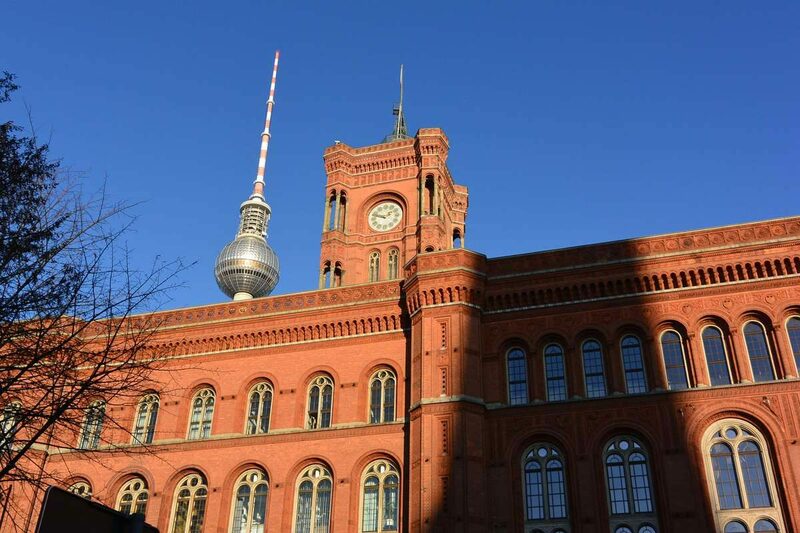 After WWII, the Red Town Hall housed the government of East Berlin. 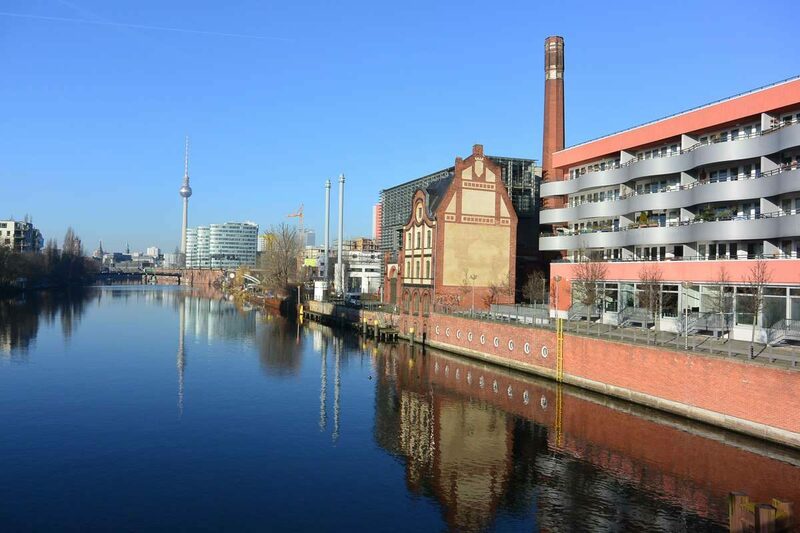 Since 1990, it again serves as the seat of government for the reunified city of Berlin. Rather unique in the city for its construction of red brick, the interior is also quite stunning, featuring arched stained glass windows, display cases with state treasures, and an exhibit with classic statues on the upper floor. It’s worth it to poke around inside for awhile. The Berliner Dom (Berlin Cathedral) is one of several scenic attractions that make up “Museum Island,” a small spit of land in the Spree River. The cathedral is the largest in Berlin – a Baroque monstrosity dating from 1465. If you’re debating about whether or not to pay the 7 EUR entrance fee, go for it. This baby’s worth it! The exterior is impressive, particularly when it turns to a fiery orange at sunset, but the inside is even more stunning. 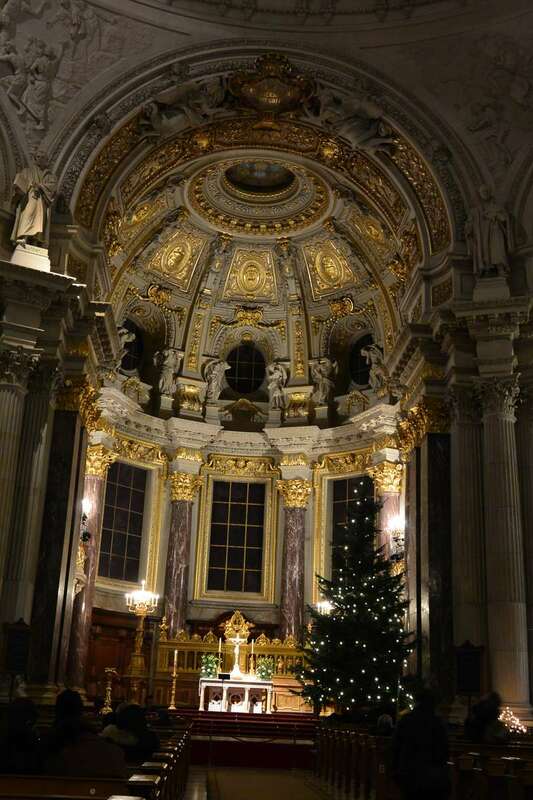 A giant Christmas tree is dwarfed by the towering, ornate dome inside the cathedral. The highlight for many is the ceiling of the main dome. Like so many buildings in the city, the Berliner Dom suffered during WWII. In 1940, a single incendiary bomb hit the main dome, starting a fire that completely destroyed it. Pieces of fiery ceiling collapsed, burning through to the crypts below. In the wake of the destruction, the reconstruction that replaced it is flawless. TRAVEL TIP: Make sure to climb the spiral stairs to the roof of the dome. Especially at sunset, the views of the city are unbeatable. Any number of buildings in Berlin offer views of the city skyline, which is particularly pretty at sunset. Options include the roof of the Berliner Dom, included in the ticket price to the cathedral, as well as the Reichstag building and the TV Tower. 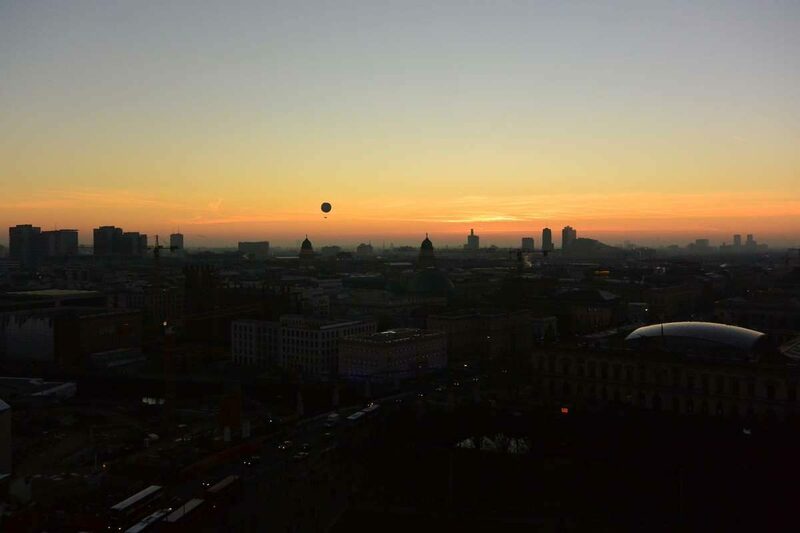 The “Die Welt” balloon, which offers tethered rides to tourists, floats above the city. At least as recognizable as the Brandenburg Gate, Berlin’s Fernsehturm is far more visible. Topping out at 368 meters, it’s the tallest building in Berlin. Search Instagram for #thattoweragain and you’ll see the TV Tower. 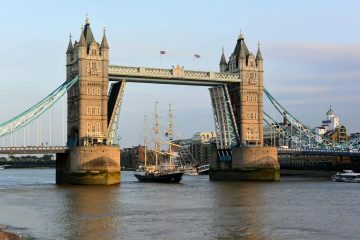 In fact, it’s difficult to take a landscape photo without the tower photobombing in the background! 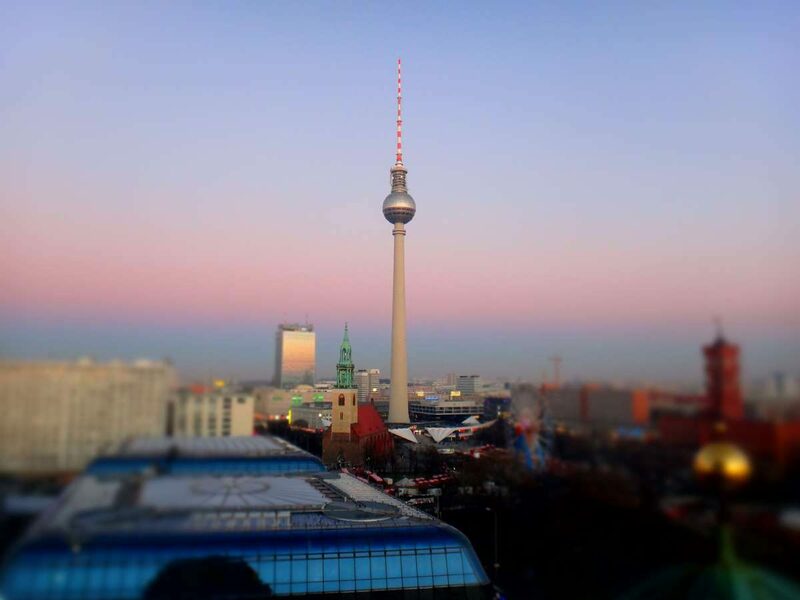 Berlin’s TV Tower has a functional antenna used to broadcast TV and radio stations. When the sun goes down, it’s nice to move indoors. Not far from the Berliner Dom, the DDR Museum is an ideal place to lose yourself, though you might want to allow a sizable chunk of time. At first glance, the museum appears to be quite small, particularly if it’s crowded. But as you move from one exhibit to the next, you’ll likely find that you’ve been overlooking all kinds of goodies. The DDR Museum highlights what life used to be like for those living under Soviet rule in East Berlin. From the groceries they bought and the vehicles they drove to the construction of the Berlin Wall and Stasi enforcement of its perimeter, the museum tells all. 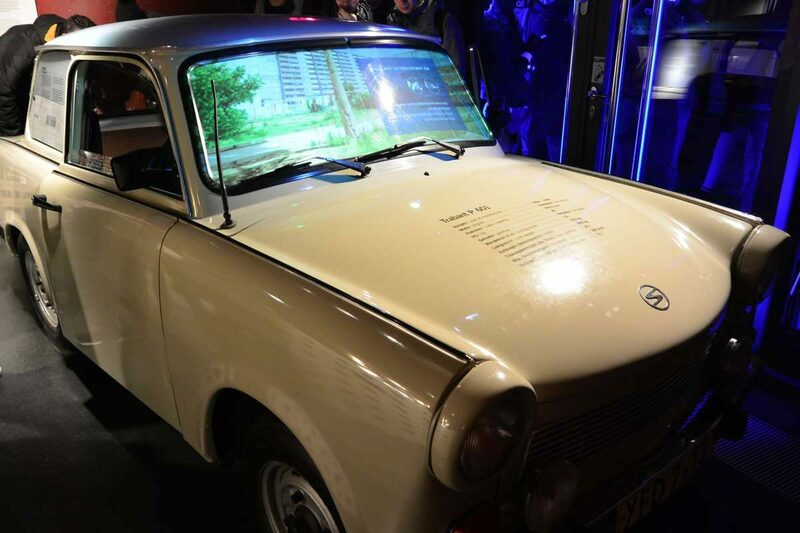 A virtual exhibit allows visitors to get behind the wheel of an old Trabant and drive through the streets of East Berlin. Information is presented in the most creative ways. Flat-screen digital screens are tucked away horizontally in Soviet-era file cabinets. Visitors can try on virtual clothes that were typical for East Berliners. An old Trabant, one of the few cars available to locals, is even on display. Visitors can sit behind the wheel and drive as if in a video game. The entire museum is brilliant – interactive, imaginative, and educational. 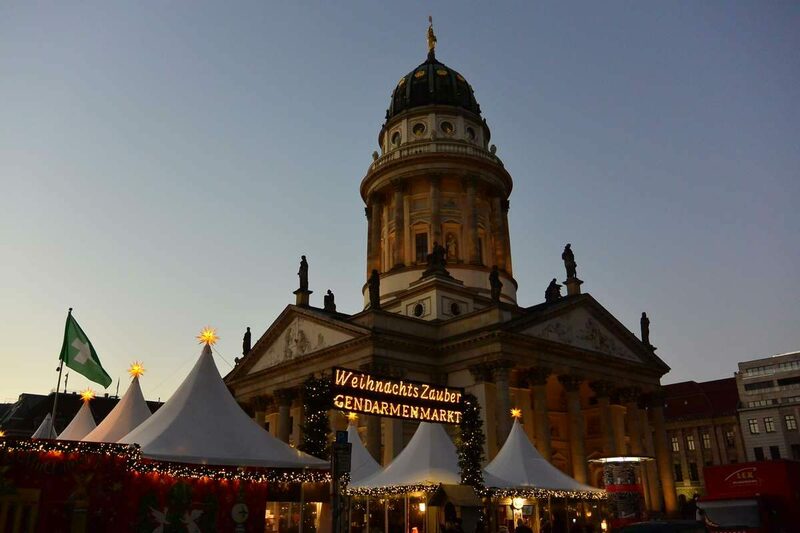 If you happen to be visiting during the winter months, head to the Gendarmenmarkt, one of Berlin’s best Christmas markets. Though it’s one of the few in Berlin that has a cover charge, it’s only €1. Their steak and chicken grilled sandwiches are insanely good. The only real problem is deciding how many glasses of Feuerzangenbowle it’s reasonable to drink! Berlin has about 60 Christmas markets, meaning you’re likely to find one in every neighborhood. Want to visit two of the best Christmas markets in Berlin? Read this to find out more. Spanning the Spree River, the Oberbaumbrücke (Oberbaum Bridge) connects two parts of Berlin that were once divided by the Berlin Wall. The double-decker lanes allow for both car and train traffic, and the bridge’s red twin towers are as picturesque at night as during the day. For photography buffs, head to the north bank of the river west of the bridge. Even if you don’t have a tri-pod, a path with flat handrails offers a great place to balance even larger SLRs. And don’t worry – if you miss your shot, trains run every five minutes, allowing plenty of time to tweak your settings and give it another go. 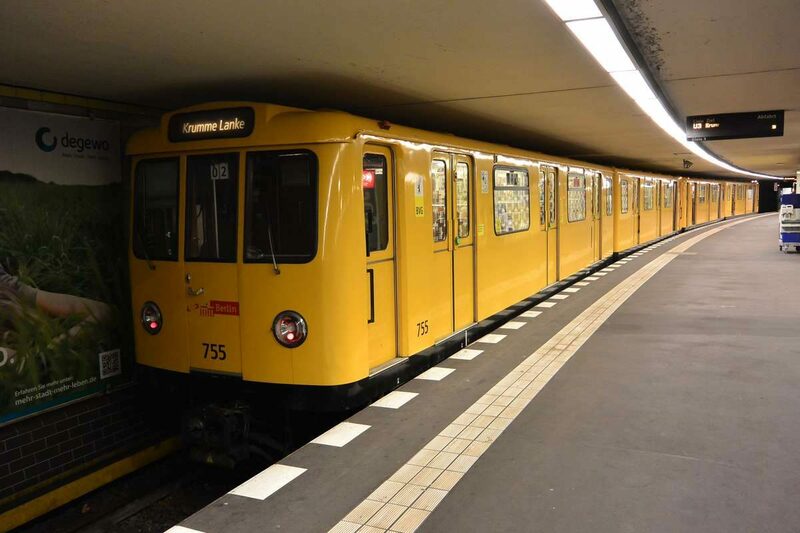 Berlin is serviced by two main train lines – the U-Bahn, which mainly operates underground in the city, and the S-Bahn, which runs underground in the city and above ground in the suburbs. While it does take a bit of practice to figure out which route on which line will take you to your destination, it’s pretty fantastic when you get the hang of it. At the end of a long day of exploring on foot, nothing looks better than the giant blue “U” indicating an underground station. 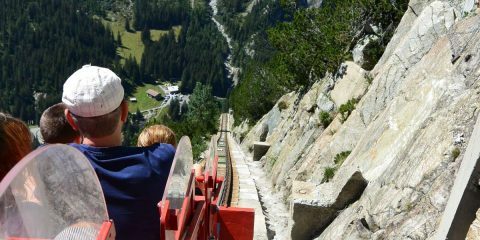 Not only are they everywhere, but €7 for a day pass offers unlimited rides. Multi-day tickets are also available. Just make sure you punch your ticket at the little machine on the platform after buying it. 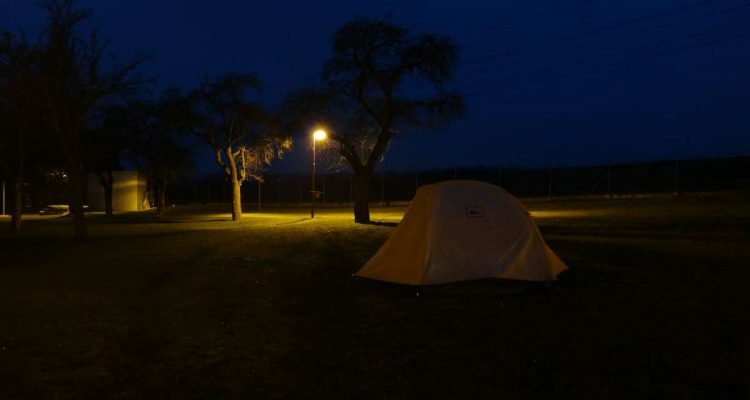 German officials are quick to dole out hefty tickets to riders with unstamped tickets! There’s no need to run for your train when the next one will be along in 5 minutes. For anyone who wants to re-trace this self-guided walking tour of Berlin, the following map might be useful. 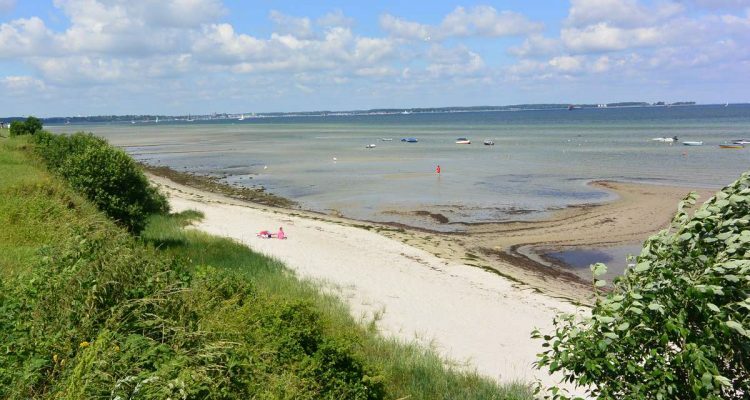 Our 11-km route covers most of the attractions listed here. Open the map full-view in Google to see multiple detailed routes. If you happen to have more time to explore the city or you’re looking for great attractions for kids, head to Zoo Berlin. 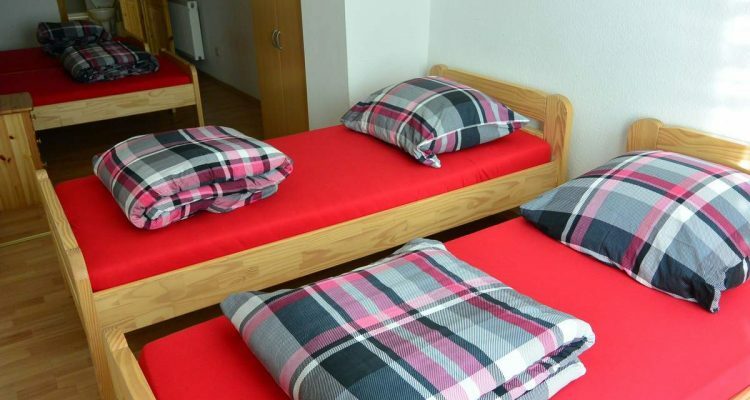 Looking for a unique place to stay in the city? 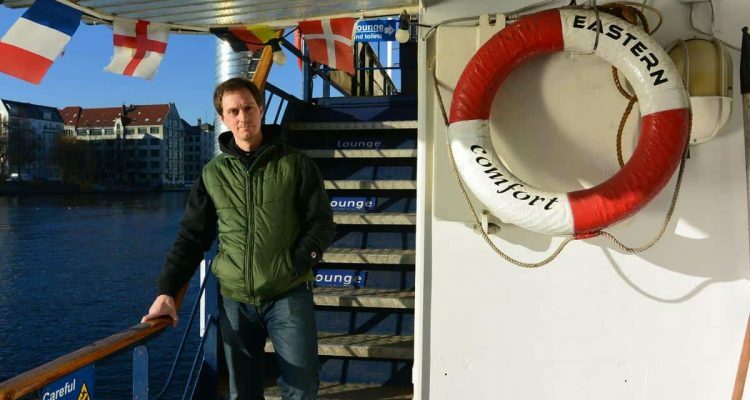 You might like the Easter Comfort Hostel Boat in Berlin. Berlin offers so much to see and do, one day in the city just isn’t enough! Planning to drive in Berlin? Like many German cities, central Berlin is included within an “Umwelt Zone,” which only allows level 4 cars with a green environmental sticker. 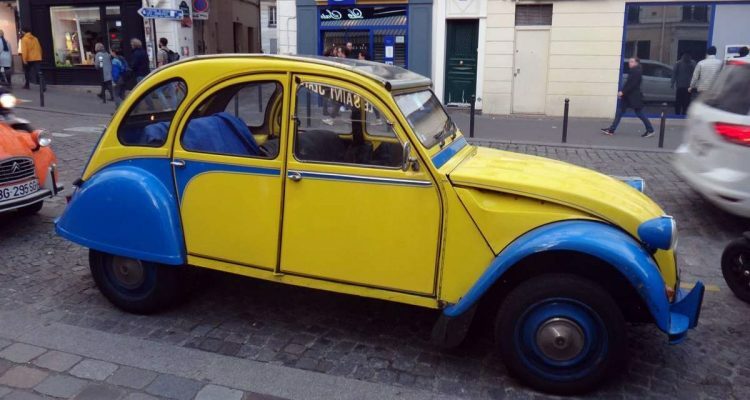 Older cars and those that are diesel often fail emissions tests to qualify for the green sticker and aren’t allowed inside these Umwelt Zones. Plan to use public transit or park outside the zone. Looking for parking outside the green zone? 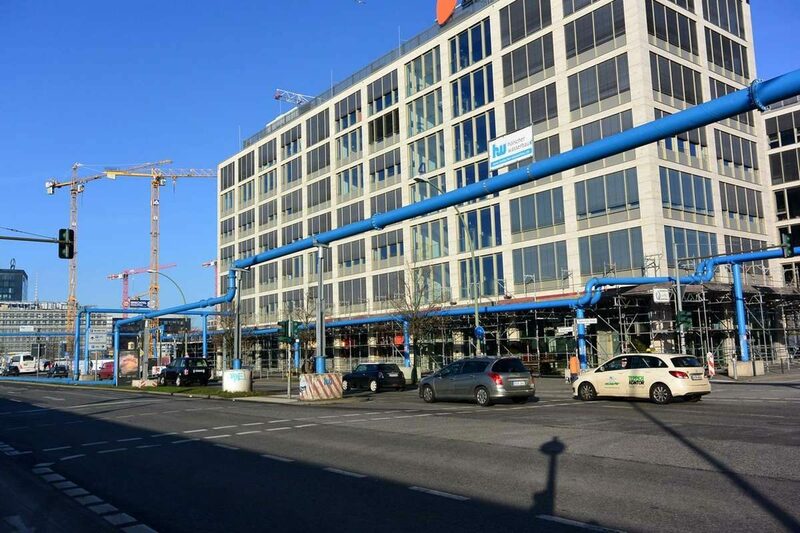 Free parking is available at most Park & Ride lots at designated S and U Bahn stations. Just locate a station with P+R next to it on this map (outside the orange oval in the center of the map).